Introduction to the Art of Chip Carving! Sat May 4, 1030a-530p SOLD OUT! Sat Jun 29, 1030a-530p NEW! Sat Sep 21, 1030a-530p NEW! Class Description: With only a knife, a pencil and some basswood, a chip carver can create truly outstanding art. 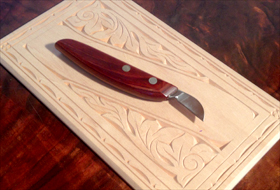 Join one of the top chip carvers in the world – David Crothers – as he teaches the basics of getting started with this fantastic, beginner friendly craft. While you may not leave this 1-day workshop ready to recreate one of David’s large ceremonial plates, in just 6 hours of class time with David, you will certainly develop the skills and confidence to explore this gorgeous art form on your own. Chip carving is perfect for the crafter with limited space as it is completely dust-free and requires no more space than a chair and a small lamp! All materials and supplies are provided for use during class and you will leave class knowing exactly what you’ll need to continue this extremely low cost hobby at home. Note: Honed knives and sharpening stones are provided for use during class but are not for students to take home.